Romance is in the air, and this month it gets a royal seal of approval with Prince Harry and Meghan Markle’s wedding. I for one can’t wait to watch them say their vows. The first time I saw Prince Harry he was little more than a toddler, running around with his brother, William at a bonfire night party near high grove house. Princess Diana – radiant and glowing – was chasing them, laughing. The second time was in Dubai, a couple of years ago, when he was playing polo. I was shocked by the sheer size of him – he is 6ft 1in with an athletic build and his mother’s smile. I’m sure he and Meghan will be very happy – after all, they’re getting married on May 19, the dat when i said “I do”, 18 years ago. Perhaps we can have a double anniversary celebration next year! 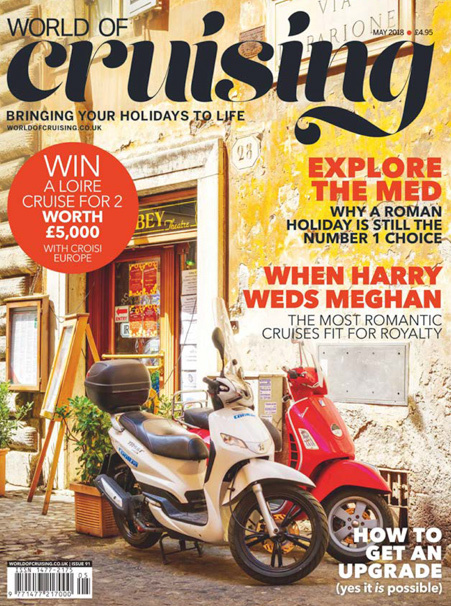 The royal couple both love travelling, so on page 24 we’ve found the most romantic cruises based on their favourite destinations, while on page 34 we speak to the BBC’s former royal correspondent Jennie Bond about the wedding and her next voyage. We also bring you the best of the mediterranean on page 70, a gourmet river cruise in southern Spain on page 92, plus everything you need to know about all the new ships launching this year on page 60. And there’s a fascinating feature on page 52 that help you choose the perfect cruise according to your personality – as well as a look as Australia’s hottest destination, Perth (page 98), now that you can fly there direct from London. What’s not to love?